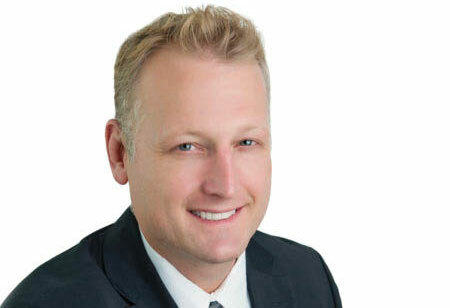 Today’s fleet managers—and their drivers—face heightened responsibilities in an increasingly competitive transportation industry. Budget pressures and regulatory uncertainty can put the squeeze on fleets, coupled with the fact we are being asked to do more with less. Under this environment, the upfront expense to adopt and implement new technologies can be a barrier to market. But I argue that we cannot afford to let that happen. Now more than ever, our industry needs to make those technological investments if we expect any significant level of growth in profitability, driver retention, and customer satisfaction. "Cloud technology is currently re-engineering how industries operate, including logistics and transportation management"
There’s no question the world around us has embraced digital business, but we must acknowledge that our industry is lagging. Most companies we know are using antiquated, paper-based transactions systems to track freight, sign for deliveries, while using mainframe computers from the 1980s. How can we expect our drivers to be more efficient, our customers to be more satisfied and our bottom line to grow when we are decades behind in infrastructure and capabilities? Cloud technology is currently re-engineering how industries operate, including logistics and transportation management. The implementation of cloud-based systems can help to optimize budget without sacrificing service. The worldwide commercial vehicle telematics market is projected to more than double over a five-year period, growing from a $20 billion industry in 2015 to a $48 billion market by 2020, according to MarketsandMarkets. As this technology gains traction, the truck will become a seamless part of the broader Internet of Things (IoT) logistics ecosystem. Not too long ago, truck drivers saw mobile devices in the cab as an intrusion. Not anymore. Today, drivers love the fact that IoT-linked trucks can improve their performance while advancing safety. Drivers can dramatically cut the time spent filling out paper logbooks to comply with hours of service regulations. Load turnarounds can be faster with freight, and locations that are tagged with RFID, NFC or Bluetooth low energy devices. That means more opportunities for additional hauls. Likewise, logistics and shipping companies can more efficiently manage freight, matching the right shipper with the right driver to deliver goods to customers in record time. Managers can use online data management and reporting tools to organize, manage and share vehicle data for informed fleet management decisions, including vehicle routing. With the right wireless solution, fleet managers can view a real-time, comprehensive map of all vehicle locations. From there, they can specify an address and locate the nearest vehicle to a given job site, while routing that specific vehicle to the next job, complete with driving directions. In addition to location, collected data points can include vehicle stops, idling time, mileage, individual driving patterns and other performance- enhancing fleet management data. From a productivity standpoint, the enterprise cloud moves the burden of infrastructure management and ongoing maintenance to the solution provider, freeing up resources to focus on strategic goals and objectives. Customer satisfaction, always a high priority, improves when technology is utilized, too. Customers no longer call companies to check on the status of packages. They are used to email, web chat and mobile apps as the communication tools of choice. And with the trip and load efficiencies mentioned above, they can get their goods faster and more reliably than ever. • Global Positioning System (GPS) technology and other equipment can enable real-time monitoring for traffic management, minimizing fuel consumption and saving transportation time. • Insurance costs can decrease, too, provided your drivers have solid records. In-truck sensors can be equipped to monitor drivers’ behavior and obtain other data critical for the pricing of insurance policies. • Drivers and fleet managers can have access to real-time predictive maintenance information, preventing equipment mishaps before they happen. • 24/7 visibility into fleet assets with access to near real-time vehicle data such as mileage, speed, fuel consumption, idle time and diagnostic trouble codes to improve operations and significantly reduce costs. • Cloud-based safety features can sense and alert drivers to dangers or distractions to help avoid accidents. • DOT compliance is made easier when a driver can pull up service history, important documents or photos from anywhere on any internet-connected device. • In warehousing, connected pallets and products will drive smarter inventory management, improve service and lower costs. • Fuel cards have been around for a while, but when integrated with online software, records can be sent directly from the pump to the cloud. Fuel economy is calculated for each fill up and the ever-important cost per mile metric is updated accordingly. This actionable data can help a company quickly see which vehicles are operating inefficiently. By investing in and implementing cloud-based services, trucking companies get the latest technology without the hefty expense of owning and managing their own hardware, software and technical staff. 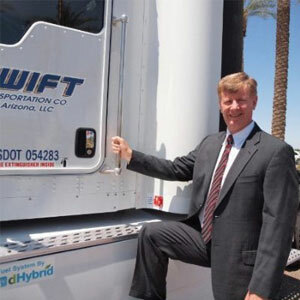 In 2017, Swift Transportation plans a series of investments to continue moving its fleet and drivers into the IoT age. It is currently launching a trial of in-cab, un-tethered tablets to assist with vehicle inspections, photographic evidence of load shifts, turn-by-turn mapping, delivery confirmations and other tracking data that can be shared paperless. Swift anticipates that most of its drivers will be utilizing these devices by the end of the year. Additionally, Swift is modernizing its internal systems. “Green screen” computers will be replaced with technologically advanced systems and programs, allowing drivers to focus on what they do best—move freight. There is so much more than can be done, as a combined, unified effort across the industry. Technology vendors today are offering sensors that can tell fleets when a trailer is loaded or empty, when its door opens, the temperature of the cargo inside, when individual pallets move and more. Collectively, if industry leaders commit to ongoing technological advancements this year, we can expect incredible business advantage shedding into 2018. It’s a win-win for drivers, customers and those companies leading the way.